Face Wipes – I love my knitted face wipes. They exfoliate, and hold a cleaner well. If you want you can even easily turn them into “to go” face wipes. Just put them in a small container and add water, a drop of castile soap, and some essential oils (Tea Tree oil is great for oily or acne prone skin). Grab one, wipe to clean, put it in the wash. If you knit then they are simple to make. I like two inch square cloths, big enough for the job but small enough to store easily. If you do not knit then you can usually find some great options on Etsy! “Mama” Cloth or Diva Cups – I don't know how it got it's name, but mama cloth is cloth menstrual products and a Diva cup is a green alternative to a tampon. Using them generally reduces cramps and shortens cycles. Plus, there is a lot less trash in your bathroom. Using Cloth Diapers – I am definitely a cloth diaper fan! Besides the financial benefit to using them, there is the benefit of less chemicals next to your babies sensitive spots, and you don't run out. Oh, and did I mention CUTE!! Here are some resources if you want to get into cloth diapers. Prefold Cloth Diapers – The cost and use of prefolds. This is generally the cheapest method and it works great, but it has the highest learning curve and most people think this method is old fashioned. Flat Cloth Diapers – I never got used to this kind of cloth diaper, but many people love them. There are also pockets (super popular) and AIO diapers (work like disposables only they are cloth). Cloth Diaper Wipes and Solution – Don't forget your chemical-free baby wipes! 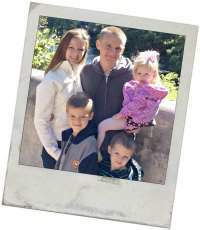 Family Cloth – Not for the faint of heart, although I must admit to occasionally thinking about trying it when I had a potty learning toddler (cloth wipes provide so much better protection for your hands – something I learned while using them for diapers). Follow Heidi Ramsey's board Crunchy Living on Pinterest. So the next section of bathroom recycling tips is how to reuse some of those pesky products. If you use liquid soap then you can add a little bit of water at the end and swish it around (it will get you a few more pumps). Toilet paper rolls have lots of uses (this is a great recycling tip for kids if you have small children). Make a bird feeder out of them by putting a little peanut butter on the outside and rolling them in seed. If you have backyard chickens, you can tape up the sides and put seed in the center, punch a small hole in the tube so small amounts of seed fall out when it is kicked around and it is a fun enrichment toy for them. Or, just use them for a craft project! If you go no-poo (that is a horrible way of saying you switch to natural, non store-bought shampoo), then you can reuse that shampoo or conditioner bottle for your own hair wash. Then say goodbye to buying those plastic bottles forever! Reuse those toothbrushes as cleaners. Just make sure you put them someplace else so you know they are no longer supposed to be used in your mouth! This video shows how you can make a bathroom rug using old T-shirts. It is definitely one of the more fun bathroom recycling tips and I think it is another great recycling tip for kids if you have a tween or teen. 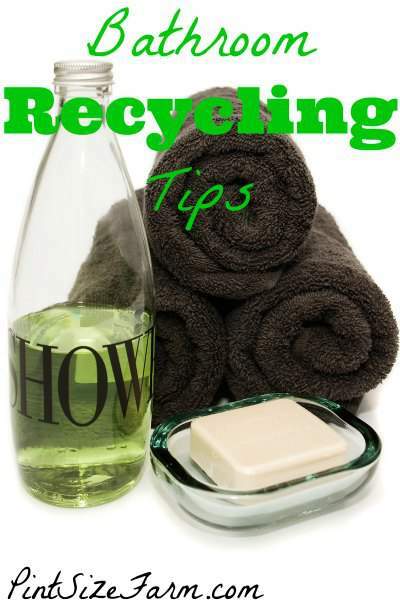 Do you have any other bathroom recycling tips in the reuse category? I found it hard to come up with ways to reuse bathroom products. And now we are on the recycling tips! Many people forget their bathroom when recycling, but the truth is, there are many products that are recyclable in there. Things like toilet paper rolls and the shampoo and conditioner bottles. Don't forget your soap containers (if you buy soap that is in a package)! You cannot recycle dental floss containers though (I didn't realize that until today!) Head over to I Want to be Recycled to get more information on bathroom recycling tips and some for other areas in your home too! They are also sponsoring a giveaway for $100 to Amazon. You could get dual flush kits for your toilets with that money or maybe switch to some cloth products! Scroll to the bottom of the post to see the giveaway details. If you have a hard time remembering then you can always put a bathroom recycling bin in your bathroom so you can do it immediately. You could put it under the sink so it doesn't clutter up your bathroom. If it is too cluttered under your sink, well… try these bathroom decluttering tips to help regain your sanity! Texas Type A Mom suggests using a second wastepaper basket and that works too! Anything to help you remember to separate those recyclables from the trash. Use a Bathroom Recycling bin! If you want to take the next step in going green in the bathroom the I suggest you start with cleaning and essential oils. Learn how to clean a bathroom the natural way and get those awful, harsh, chemicals out of your home completely! While not one of the bathroom recycling tips, it does help you live a healthier lifestyle. Many thanks to the I Want to be Recycled campaign for sponsoring this giveaway! What will you do with your $100 Amazon gift card? You could switch your toilets to dual-flush, or change some of your products to cloth, or maybe you could get a bathroom recycling bin! So many options. Good article and great tips. I am especially interesting in the dual flush toilet. I had never heard of that before and was wondering if you have one in your home and how well do you like it? This is something I need to show to my husband to see if this would be something we should get. I appreciate you honest opinion. Pinned & twitted. We do (on both of the toilets) – we used the dual flush kit that I linked to in the post. It was really easy to add and seems to save quite a bit of water. The light flush is about half of what our old flush was (and we had a low flow toilet anyway). Totally agree with your recycling theories here! Especially those toilet paper rolls, they have so many awesome uses. And toothbrushes, we always use them for cleaning the tile and other small spots. But disposable diapers, that’s a tough one for me! I wouldn’t trade my cloth diapers for anything, LOL! Once you are past the learning curve they work so much better than the plastic ones. Very insightful. I totally agree with you. Especially the double flush. If you imagine the amount of water we use in toilets its crazy.Through proper water utilization, we can create sustainable water usage. Thanks for the cool tips! I am also a fan of cloth diapers, they save a lot of money and it’s not so hard to clean them, which is perfect. 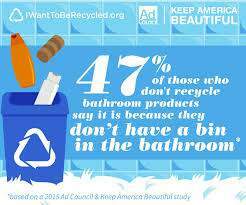 I never knew that so many things in the bathroom can be recycled, it’s a big loss that many people don’t do it. It definitely made me consider the organising of the bathroom in our home. I couldn’t agree more in this post! Recycling is an easy thing to do and something that we should act now.